On March 8th, 2004, a newly raised Freemason named William James was shot and killed during a hazing incident that went horribly wrong at South Side Lodge No. 493 in Patchogue, New York. The lodge had its own social group, The Fellow Craft Club, and they had come up with their own unauthorized ritual for joining it that was completely outside of anything approved of by the Grand Lodge. At one point, James was seated in a chair in the basement, and a Brother was to aim a pistol loaded with blanks at him and fire it. Behind him, other Brethren were supposed to simultaneously knock down a pile of metal cans and other objects in order to scare the crap out of him. Supposedly, this was to impart a lesson of trust to the new Brother. Elderly Brother Albert Eid, who was a decorated Navy veteran, then mistakenly pulled a loaded .32 caliber pistol out of his left pants pocket, instead of the .22 pistol loaded with blanks that was in his right one. As a result of his momentary confusion, he shot James in the face, and killed his fellow Mason in this tragic and horrible accident. The lodge was ultimately dissolved by the Grand Lodge of New York, its members were suspended, and in January 2005, Eid was sentenced to five years' probation by the court. The story was widely reported in the press, repeating over and over that a Mason had been killed by one of their own members while conducting a creepy ritual. Ever since that horrible incident, Masonic jurisdictions have struggled with the question as to whether or not it was proper to allow Brethren to bring firearms into a lodge meeting, or even onto Temple premises. Grand Lodge rules differ, depending, in part, on federal, state, and local laws regarding open- or concealed-carry, permit requirements, as well as having special exemptions for off duty law enforcement officers. There has also been the uniquely Masonic question that arises as to whether or not the divesting of all metal objects, mentioned in the EA degree ritual to prevent the candidate from bringing anything "offensive or defensive into the lodge," is applicable to all Masons and at all times in lodge meetings. Recent headlines have complicated the matter, especially in the United States. There have been high visibility school and workplace shootings, and even churches have not been spared from gun violence. The FBI's foiling of a planned attack on the Milwaukee Masonic Center several months ago by a would-be Muslim terrorist have brought the issue to the forefront in many jurisdictions, especially given the anti-Masonic attitudes and threats of violence by some fundamentalist social and religious commentators in some Muslim countries and communities. In my own jurisdiction several years ago, a Grand Master issued an edict banning guns from Masonic Temples in Indiana for the duration of his year, after an incident during a Past Master Degree, a prerequisite ceremony for men elected to become Worshipful Master of their lodge here, that has, in many cases, become little more than an excuse to engage in hazing of the incoming Master. The candidate is required, as part of the evening, to demonstrate that he knows how to conduct a Stated Meeting and deal with Masonic law, motions and amendments, and even handle open arguments between Brethren during a meeting. Two off duty police officers attending one of these degrees staged such an argument, and at one point, both actually pulled out their sidearms and threatened each other, as a prank. The Grand Master heard about it, and was not amused. The issue is not isolated to the US, either. In one jurisdiction in the Middle East I have been told by several Brothers that the Tyler is openly armed, precisely to prevent attacks such as the one planned in Milwaukee. Arguments have raged back and forth between those who advocate various bans, versus the belief that citizens may be able to lessen or even prevent gun violence by being armed themselves. These disagreements have no simple answers. 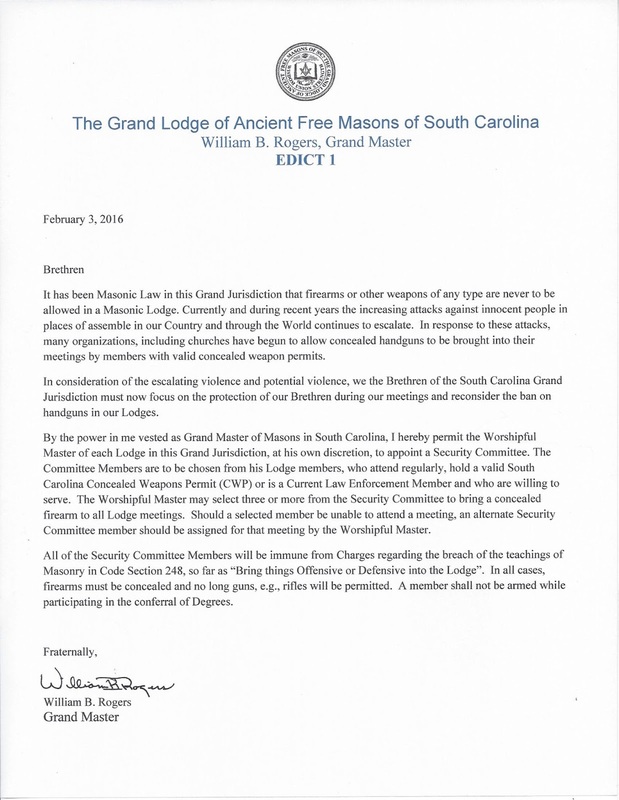 On February 3rd, the Grand Master of the Grand Lodge of South Carolina AFM, MW William B. Rogers, issued an edict that attempts to address the issue in a responsible manner. 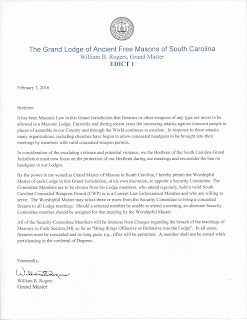 The Master of each lodge is given the authority to, at his own discretion, appoint a Security Committee from among his own members, and they must each have a valid South Carolina Concealed Weapons Permit, or be a current law enforcement officer in that state. The Master is to permit three or more of these Committee members to bring concealed pistols (not rifles) into lodge meetings, and if one or more is not present, he may appoint other members who fulfill the requirements to do so for that meeting. The guns must be concealed at all times, and members of the Security Committee are to be exempt from the Grand Lodge rules regarding nothing offensive or defensive being brought into the lodge. However, no one may carry a weapon while participating in the conferral of the degrees of Masonry. It's a unique solution to the question, and I suspect that more GMs will examine MW Rogers' edict and its results closely in the coming months. One thing's for certain: no one else needs to die in a shooting in a Masonic lodge. Ever. I continue to be amazed at masons who apply the EA candidate being divested of minerals and metals as applying to people other than the candidate. I know of no mason who brings a weapon into lodge because he feel the need to protect himself while in lodge. If he carries (legally) a firearm while traveling to lodge, leaving it in the car is not a proper way to secure it against thief. Abide by the law of the community. Don Laughlin, Senior Warden, Arlington Lodge No. 438, TX. I believe in this, however, we use that "Don't ask, don't tell" policy. My perceptions are that most of of brothers, when in the Lodge Room", are carrying, but no one asks or discusses it. This could create a liability issue however. If this hypothetical brother can't leave his firearm in his car, perhaps he should just leave it at home before he goes to lodge. Weapons don't belong inside a lodge room. Period. Maybe we could all come up with a position that we could appoint a trusted brother to? A position in which they would be armed with an implement of some description and charged with providing security while the lodge is open? Who is Samy Mohamed Hamzeh? To be an active Military member of the Armed Forces in a hostile environment or a full time Law Enforcement Officer is a very special and unique experience. No amount of book learning can give you this experience. In my own jurisdiction of Washington State, we had a Master of the Lodge who was a full time Parole Officer and he always carried his concealed weapon. Due to his unique line of work and some of the borderline insane people he had to deal with, I felt safe knowing that he was armed in Lodge. At any moment, one of his more tougher charges (Parollees) or their friends, could challenge him and they could care less about a Lodge meeting. Mature regular Masons who are serving the military in very ugly hostile environments of the Middle East or Senior (Parole Officers are senior cops) Law Enforcement Officers may need to carry a firearm into Lodge and fellow brethren should not be afraid of it because these MATURE Brothers are to be regarded as PROFESSIONALS. Hazing, pranks, joking around, and horse play, have no place in a Craft lodge. Any Master allowing such behavior has no business wielding the gavel. I think the Grand Master of South Carolina has the right idea and I imagine some of our brethren of early Colonial times (Military Lodges) would agree. If I were Tyler, I would carry. I have the legal right to carry in my state and what Brother Hodap holds out as an example of why not was people being stupid. There was no Masonic reason for either of those weapons to drawn. So, why would I carry as Tyler? A Tyler's duty is to protect the lodge and the Brothers while they are meeting. Unfortunately, our lodges and members are sometimes attacked by lunatics. A dull sword isn't much protection. A properly armed Tyler is. So, we do have a Brother charged with security, just with the wrong implement. ".....bring nothing offensive into the lodge......" pertains to the candidate, who is an unknown. Throughout history members wore their swords into lodge meetings. If a member has a concealed weapons permit I see no reason why they should not disarm themselves for a meeting. I have been to lodges that have a gun locker where a person could leave their handgun and keep the key with them. This would be fine for a member participating in the degree. I was told that when PGM Truman would attend my lodge in D.C. (Federal #1)as President, his security detail would have to remain outside with the Tyler, or if a Mason, would have to lock his weapon in a special box in one of the lodge's lockers. Personally I find the very idea of bringing weapons into the lodge room preposterous and deeply offensive. A Mason should leave his firearms (and swords and axes and chainsaws and whips and whatever other weapons he owns) at home when he travels to lodge. I find myself at a loss as to why this is even a topic of discussion...it simply seems self-evident to me that weapons don't belong inside the lodge room, and I can't relate to or understand the thinking of those who feel they can't attend a lodge meeting (or go anywhere else) without being armed. It's simply a matter of civilized behavior, as far as I'm concerned. There's only one brother at a lodge meeting who should be armed, and it's not a coincidence that his station is OUTSIDE the lodge room. Way back in 1983, I visited a lodge in rural Tennessee. The tyler was a sheriff's deputy. He was in his uniform and armed with a handgun. When I pointed out to him that the firearm was not 'the implement of his office,' he said that they couldn't find the sword so this would just have to do. He, of course, stayed outside of the lodge room for the entire meeting. So, even there, back then, it was understood that a tyler is an armed guard. The traditional weapon is a sword. Even when the tyler is invited to sit inside the door he does not bring the sword with him. I think all the evidence points to the fact that weapons should not be inside the lodge room, which is a different place from the lodge building. I think it's fine for someone, preferably the tyler, to be armed with a sword and perhaps a handgun as long as these stay outside the lodge room. If security is an issue you can have the Tyler and an armed detail of brothers (two perhaps) outside the lodge. I see no reason for weapons to enter the lodge. If not you can hire an armed security guard for the hours that lodge and harmony are held, but weapons should not be brought into the lodge. And I'm a Life Member of the NRA.